YET ANOTHER ELECTION announcement, yet another controversy. 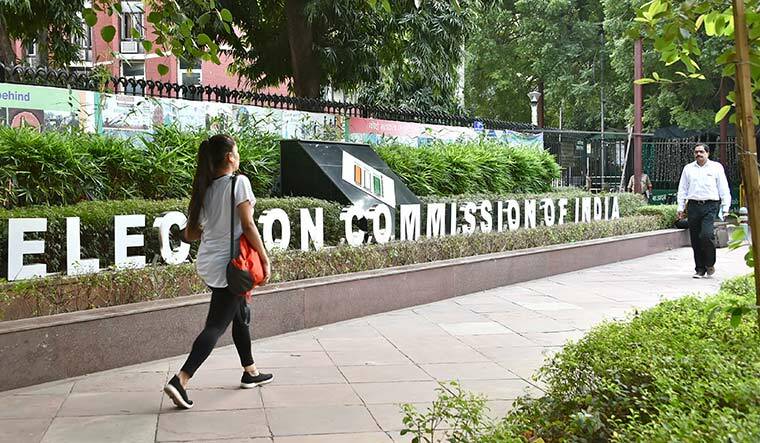 On October 6, the Election Commission announced the schedule for elections in Madhya Pradesh, Rajasthan, Telangana, Chhattisgarh and Mizoram—collectively dubbed the semifinal before the Lok Sabha elections. However, the commission’s decision to defer its announcement prompted the opposition to claim it was done to let Prime Minister Narendra Modi announce sops at a rally in Ajmer. As the government appoints election commissioners, they are vulnerable to attacks from the regime’s rivals. The poll announcement was delayed from 12:30pm to 3pm, which the commission said was done to give the media more time to reach the venue. A message about the announcement had gone out to the media just that morning. However, Chief Election Commissioner O.P. Rawat offered three other reasons. Two related to the delay in publication of the electoral roll of Telangana, which the commission came to know about only that morning. The third was that the Tamil Nadu chief secretary had called him, urging him not to announce date for byelections as a cyclone had been forecast. Sources in the commission said they had to meet to discuss these issues, which caused the delay. However, speculation refused to die. In fact, in the past one year, the commission has often been accused of being partial to the ruling BJP. About a year ago, Rawat’s predecessor, A.K. Joti, had announced the schedule for the Himachal Pradesh elections, but not for Gujarat. Traditionally, the dates for both states had been announced together. The move was hence seen as helping the ruling BJP, and the commission received flak from parties as well as former election commissioners. A few months later, the EC disqualified 20 Aam Aadmi Party MLAs for holding office of profit. The party went to court, contending that the legislators were not given a hearing. In a major embarrassment for the commission, the Delhi High Court asked it to hear the case all over again. There were other accusations from opposition parties, including claims that the electronic voting machines could be manipulated and that the voter-verified paper audit trail was not working. Joti was slammed by the BJP’s rivals, who pointed out that he was a top bureaucrat in Gujarat when Modi was chief minister. It was claimed that he was handpicked by Modi as an election commissioner. His successor Rawat, too, has not been spared, with the opposition claiming that he is close to BJP leaders. Experts, however, say the commission cannot be vilified on the basis of a few decisions. “The commission’s judgment was not questioned by the Congress when [the former] took a decision in the matter of the Rajya Sabha elections in Gujarat,” said former chief election commissioner S.Y. Quraishi. The commission had cancelled the votes of two rebel Congress leaders, which allowed veteran Ahmed Patel to narrowly win the election. But, more importantly, amid all the allegations, some deeper issues have been overlooked, including the flawed system of appointment of election commissioners, legal constraints that hamper the commission’s functioning, and parties targeting it when they lose elections. As the government appoints election commissioners, they are vulnerable to attacks from the regime’s rivals. It has been demanded that the commissioners be chosen by a collegium. “The appointment process and service conditions renders them vulnerable. This may explain the tentativeness of some of their decisions,” said Jagdeep Chhokar, founder-trustee of Association for Democratic Reforms. The chief election commissioner can be removed only by impeachment, but the election commissioners do not have this security of tenure, and hence, may not want to annoy the government, he said. In the commission’s defence, it seems to be caught in a political crossfire. While parties can criticise it in the public domain, the commission cannot counter as it is not in the business of building public opinion. The commission also has to deal with legal constraints that hamper its efforts to provide a level playing field in elections. There is no cap on party expenditure, which leaves it helpless in checking abuse of money power. The laws are inadequate to tackle bribing of voters and the menace of paid news is growing. The commission’s request that the latter be made a criminal offence is pending before the Supreme Court. The commission has powers to register parties, but it cannot deregister them. And, despite the commission raising serious concerns about electoral bonds, the government went ahead with it. Former chief election commissioner T.S. Krishnamurthy said political parties have shown reluctance to implement electoral reforms as the status quo provides scope for manipulations. “Our political parties are not looking at long-term gains to improve the quality of democracy,” he said. Most of the reforms in electoral law and process have been brought about by judicial intervention, he added. So, even as the commission’s impartiality gets questioned, the political establishment may really be to blame.